that is designed to last! AeroGlass® products adhere strictly with all aviation safety and certification standards mandated by EASA and FAA regulatory authorities. 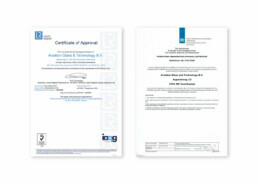 Aviation Glass & Technology facilities are EASA Part 21G, ISO 9001:2008, and AS9100D certified. Our mirrors and transparencies have been subjected to an extensive series of tests, executed under the supervision of an EASA delegate at an external testing laboratory, and our in-house testing facilities. We collaborate with our customers to define testing requirements and ensure specification compliance. For additional information regarding certification, testing, or quality, please contact us at +31 342 472 083. Alternatively, you can reach us by e-mail at info@aviationglas.aero. We will be happy to address your questions.